Happy Wednesday, Darlings!! Today I am so happy to be able to introduce a dear friend as the Maker for today. I met this lady through some mutual friends, a while back, and I am so happy that I did. Leah is so very lovely and her art makes me swoon. I hope you enjoy learning more about her. Science and art, together? Most people are a bit baffled when I tell them that I create science/nature inspired art. Let me tell you about how this combination became my home-run business. The outdoors and art have always been a part of my life. I have a nature-nut as a father who took us hiking, camping, fishing and exploring. And then my mother is an artist. I like to think I took both of their passions and created my own. As a child, I loved nature. Sure, kids like being outside, but I would go for long walks in the woods, and take sample specimens of plants that I didn’t know how to identify and bring them home to determine what species they were. High School biology solidified my love for science. I entered University to obtain an honors degree in Environmental Biology. I was fascinated with species identification and learning about the interactions and balances that exist in nature. 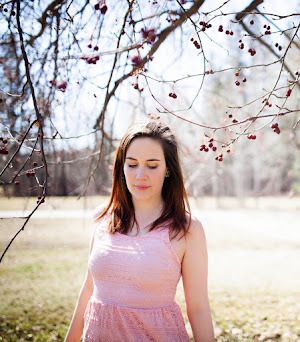 I graduated with my Honors Environmental Degree and proceeded to do some travelling. Returning from these adventures, I then enrolled in a two year Fine Art Diploma. When I finished this schooling, I was left with the question of how to do both, because they were equally important to me. 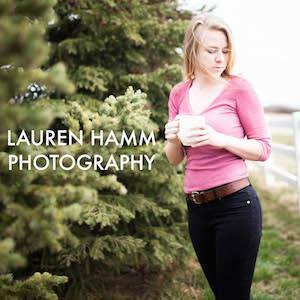 My business, Leah Bargen’s Art, grew out of this yearning to combine these two interests; the unexpected combination of science and art; the ability to depict beauty, while also creating an understanding and appreciation of the world around us. One of my favorite ways to paint is to combine watercolour and ink. I love depicting the colour of the subject with loose, vivid expression, but then come back into the piece once dry and define the subject’s structure with ink. To share this process with all of you, I have put together a series of photographs depicting the painting of a two-spotted ladybug beetle (Adalia bipunctata) and its larvae. Showing people beauty where they might not expect it is why I chose to paint an insect. Everyone knows the ladybug beetle, but so few recognize its larvae. Finally, go into the watercolour with ink and give it structure! I hope you have enjoyed watching me paint. It's exciting to see how colour, light and shape can create something beautiful. Currently, I am selling my originals, prints, as well as turning some of my work into greeting card sets. This ladybug is part of an insect greeting card set that will be released late October. I run my business out of home with my three beautiful, busy children and my supportive husband always encouraging me to create more! Leah would love nothing more than to give one set of her lovely Watercolour Bird Greeting Cards away to a lucky reader!! 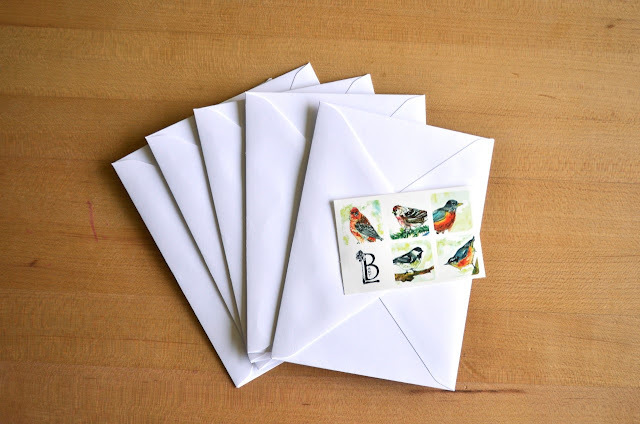 It is a set of 5 and they include envelopes and matching bird stickers to seal the envelopes! How lovely!! Please note that the giveaway of the Set of 5 Watercolour Bird Greeting Cards is only available to Canada and the USA. 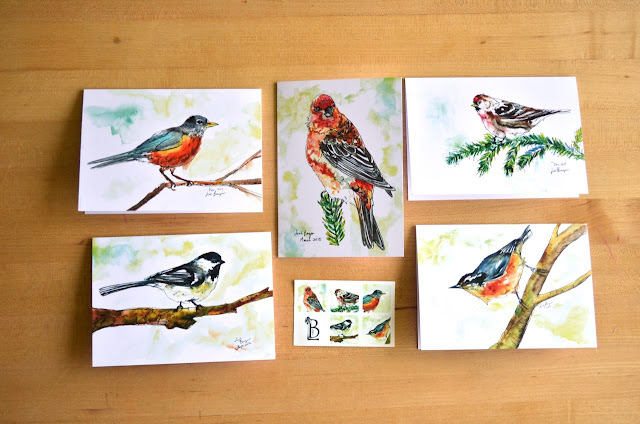 What: One lucky winner will when a Set of 5 Watercolour Bird Greeting Cards from Leah Bargens Art. When: You will have until midnight on Tuesday, October 18th to enter this giveaway. I will be announcing the winner on October 19th. - share this giveaway on Facebook, Twitter, Instagram, or on your own blog! Isn't this exciting? I have been missed doing both Maker Series and Giveaway posts, and I am thrilled that I can do both in one today!! Yay. Thank you so much, Leah, for coming on the Knotted Home and allowing us to learn more about Leah Bargen's Art & Photography! Please make sure you visit Leah over on her Facebook Page and give her Etsy store a follow!! I am currently in love with her Red Fox, Pine Grosbeak, and Trembling Aspen prints that she has in her Etsy store. I also need a Set of 5 Watercolour Bird Greeting Cards, they would be perfect Christmas cards. Absolutely stunning and unique art work!!! Liked her page! Thanks for your entry, gorgeous!! I like her page on Facebook! I love her cards! Such a great idea for Christmas presents. Leah's cards are even more gorgeous in person. The colours are really vivid, the details are exquisite, and the cardstock is so luxurious! Beautifully done, Leah. Glad I bought some! ooh I bet they are!!! ooooh. If I don't win some I will definitely be buying some! Hehe Totally, right? I cannot win so I am totally buying some! Thanks so much for your entry. I love these cards and the others Leah has made! Thanks for your entry, gorgeous!!! YAY!! Beautiful. Love Leah and her art :) Liked her fb page already! How do I give you my contact email? Hello! Feel free to leave your email address here. :) Thanks so much for entering! !